Using custom magnetic signs is a great way to communicate with customers who are on the go, while you're on the go! Many small- to mid-sized businesses use company vehicles for both work and personal use. Let people know when you're open for business through custom magnetic signs. Every time you pass by pedestrians or other drivers in your company vehicle, it will serve as a promotional sign for your business with our custom magnetic signs and decals. It is an easy way to let people know the address, location and hours of your business, for example, without having them walk straight to the storefront. Instead of permanent custom banners, these custom magnetic signs make it easy for companies to kick off special promotions or contests because they are portable, easy to apply and easy to remove. No damage is Done, and no special tools or solutions are ever needed for application or removal! 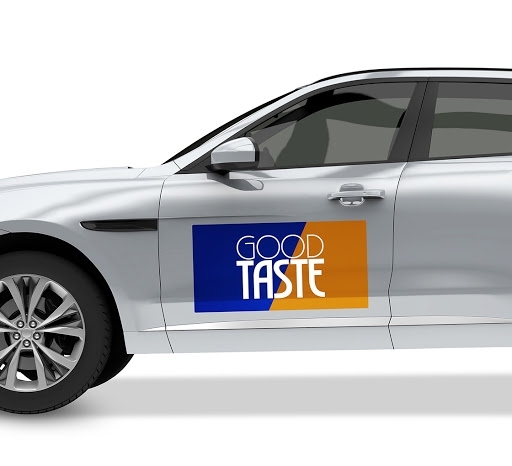 For example, a radio station could ask its listeners to find the temporary car decal on a vehicle in order to win free tickets. Once the event is over, street team workers can quickly and easily take off the custom vehicle magnets. At BannerBuzz, our custom magnetic signs and custom vehicle magnets are made to last the harshest weather conditions for six to 12 months because each item is 3 mm thick. 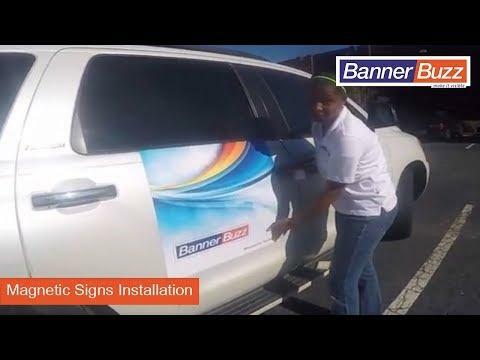 Users do not have to worry about their custom vehicle magnets falling off while they're driving on the freeway or are stuck in rush hour traffic because the corners of each banner are rounded to fight the wind and remain on the car. Your workers can use custom vehicle magnets as a way to engage with onlookers and other drivers on the road without worrying about a thing. We have a gallery full of templates for you to choose from, but if you want to make the most out of your custom banner and magnetic auto signs, we also have easy online design tool that will walk you through the steps to make the ideal promotional piece for your business.